What was the first sugar-coated corn flake cereal? 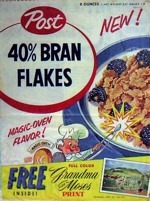 Post 40% Bran Flakes cereal was introduced in 1922 by the Postum Cereal Company. The Postum Company became part of the General Foods Corporation, which in turn joined forces with Kraft Foods, who currently own the Post Cereal brands. The early slogan for this cereal was "Life is swell... when you keep well." Ads promoted Post's 40% Bran Flakes as having 3 extra benefits over existing cereals: 1) Your Daily Bulk - because it contained bran, "a natural regulator to help protect against sluggishness due to lack of bulk in your daily diet"; 2) Valuable Food Essentials - because it was made with "sun-ripened wheat" and supplied you with "phosphorous for the teeth and bones... iron for the blood... and Vitamin G! "; and 3) Vitamin B1 Generously Added - this was touted as "a third extra benefit at no extra cost." A 1934 ad for the cereal suggested that "feeling slow, low and generally no good" might caused by "a sluggish intestine" and hinted that Post 40% Bran Flakes could increase "Git-Up-And-Go". According to the ad, "a lot of people are inclined to call (this cereal) the most delicious cereal they know." In 1979, the first 5 ingredients listed for this cereal were bran flakes with other parts of wheat, sugar, flavoring, corn syrup and salt. 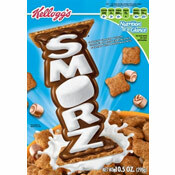 Click here to see all cereals from Post. These are the most recent images. 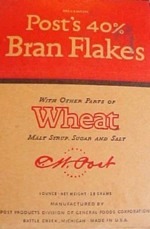 Click here to see all pictures for 40% Bran Flakes (Post). 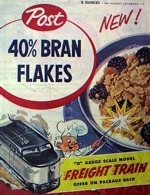 What do you think of 40% Bran Flakes (Post)? View all 56 comments for this cereal. Can I please get the recipe for the muffins they had on the box for years... 40% bran flake muffins. I loved 40% Bran Flakes. Why did they ever quit making it. Is it available anywhere? What a very bad decision to stop making it. Best cereal EVER! PLEASE bring it back to the U.S.A.
What a poor decision on Post's behalf. Current product is nowhere near the flavor of the 40% product. Please bring back 40% Bran Flakes. Really a great cereal. Have loved this cereal for years. I thought Post didn't make it anymore because the cereal box didn't say 40% on it. So glad to find out Post still makes this. This is the only cereal I enjoyed eating 365 days a year. No other cereal comes close. I wish they'd bring it back. 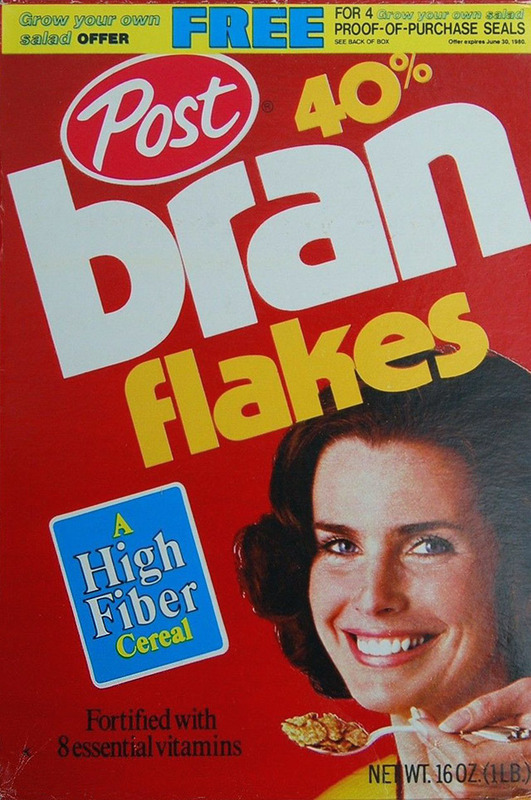 - Tim K.
I LOVE the POST Bran Flakes! But... I can't find them anymore in Van BC Canada. Dang it! 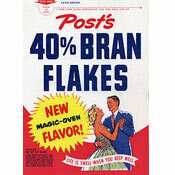 Let's boycott Post until they bring back the 40% Bran Flakes. This was the perfect cereal and bran flakes now are all the same in taste. May the boycott begin!